Ever wonder what water parameters are and how they affect your Betta fish? The answer is they are the overall condition of the water in your tank. Your fish can be affected in many ways by the condition of the water. Example: If you water condition is not idea for your fish it can make them sick. When you have a sick fish the water parameters are one of the first things that should be checked. Regularly checking your water parameters is a must to keep your fish happy and healthy. To do this all you need is buy a test kit and a few minutes of time. This simple test will tell you the compound concentrations of your fish tanks water. An alternative way to test your water is to take it to your local pet store. Most pet and fish stores will test your water for you free of charge. Each one of the tests have different time frames in which they need to be done. Some tests need to be done daily, others need to be done every few days and weekly. Here are the most list of the most common water conditions and parameters that affect the health of your betta fish. Temperature: To check the temperature of your tank you will need an aquarium thermometer. You should check that the water temperature is in a safe range (75 F to 81 F) and stable daily. Ammonia poisoning is compounded when your tank water has an alkaline water pH (above 7.0). Cycle your tank water – You need to cycle your tank water before adding your betta fish. Full water change – A 100% water changes must be performed before any ammonia becomes present. Remove uneaten food – Remove any unwanted food from your tank in a timely manner. Remove decaying plants – Remove any decaying plant matter as this will decompose and become ammonia in your tank. Nitrite (NO2): Autotrophic bacteria consume ammonia and give off Nitrite as a waste product. Nitrites are slightly less harmful to betta fish but they are still very dangerous to your betta. This compound is formed when ammonia is present in your tank water and has not been processed by other bacteria. This usually happens when your tank is going through the Nitrogen Cycle. You will need to do a full water cycling of your tank before adding your betta fish to it. When a full water cycle can not happen you may want to consider not using a filter. Filters house bacteria that produce Nitrites which will introduce them into your tank. Nitrate (NO3-N, NO3-): Nitrates are the byproduct of the bacteria that consumes nitrite. 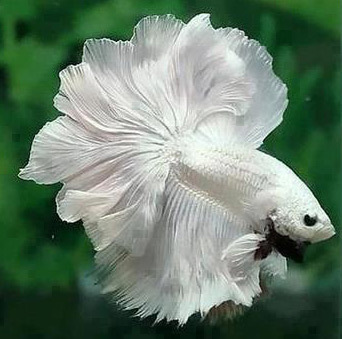 It is less toxic to bettas and most other aquarium fish. To keep nitrate levels under control you will need to do a partial water change once a week. Changing about 20% of the water is plenty to keep the nitrate levels under control. It is important to test for nitrates in you water weekly this will ensure that your nitrate levels are staying in a healthy range. Healthy nitrate range 20 – 30 ppm however you want to shoot for less than 20.
pH – There are 2 types of pH levels that affect your fish. pH levels are measured using a number scale. Example: If your water has an equal amount of acids and bases it will be neutral and should read as a pH level of 7.0 when you test it. Most aquarium fish thrive in a neutral pH environment. You will need to have a pH water testing kit and you can get this from any pet or fish store. You should test your aquarium water at least once a month and anytime you have a sick fish or a fish death. pH levels should not fluctuate more than 0.2 in a 24 hour time period. Gh: (General Hardness) – General Hardness is used to measure how hard or soft your water is also known as“hard water” or “soft water.” The hardness of water can be measures by the amount of calcium and magnesium dissolved in you water. Betta fish can tolerate a large range of gh. Kh: (Carbonate Hardness): KH is also known as buffering capacity. The Kh measures the amount of carbonate (CO3–) and bicarbonate (HCO3-) present in your water. The kh becomes important when it is low. Proper Kh allows your water to work like a “buffer”, this will keep your pH stable. When your Kh is low, your water can no longer keep your pH stable. This can cause a rapid drop in pH levels. A rapid drop in pH levels can cause your fish to die quickly. If you do not have good Kh levels in your tank, you will likely have to add “buffers” to your water at every water change to keep your pH stable.